This new textbook provides a clear, informative and rigorous guide for students taking Religious Studies GCSE with all the major exam boards. 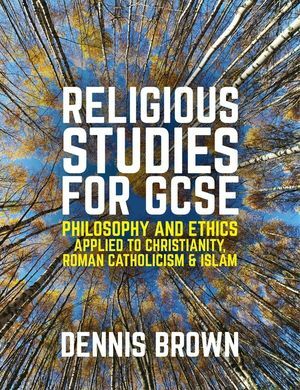 It covers the philosophy and ethics content of the key GCSE specifications and examines these themes from the perspectives of Christianity, Roman Catholicism and Islam. Throughout the book, emphasis is placed on the scriptural basis of each religious view and on other sources of authority in each religious tradition. The development of core ethical and doctrinal questions is explored, and key thinkers and theologians are introduced to give a sound understanding of complex issues. Chapter by chapter, the book covers such topics as religious texts and sources of authority; the existence and nature of God; revelation and religious experience; the problem of evil; science and religion; death and life after death; human nature and personal relationships; human rights, conflict and crime; and global issues. There is also a dedicated chapter on study skills and exam techniques, and each chapter includes student-friendly features such as revision summaries, questions and activities. While the book has been designed with the new GCSE specifications and reforms in mind, it encourages students to see the full significance of these issues by going beyond the narrow confines of their own specification. As such, Religious Studies for GCSE will be the ideal companion for investigating this rich and fascinating area of human life. Dennis Brown is Head of the Religion & Philosophy Department at Manchester Grammar School. "This authoritative textbook is comprehensive in its coverage of all the GCSE philosophy and ethics material from the major exam boards. Packed full of case studies, diverse references and fascinating ideas, it is an essential reference book for GCSE students and teachers. It guides students through complex issues which will grab attention, spark interest and give them everything they need for the philosophical and ethical sections of their Religious Studies GCSE. I believe it will inspire them to go beyond GCSE and even further into this fascinating subject." "This book provides a level of depth beyond the scope of most GCSE textbooks. It will be a great support for anyone teaching Christianity and Islam for the new GCSE and contains the additional information needed to stretch and challenge the most able students."